GVB workers (public transport: metro and trams) are fighting against a 40% cut to services in Amsterdam (120 million euros). This is bad for everyone! 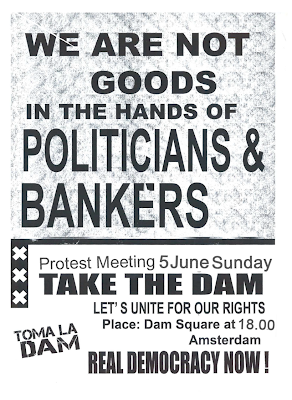 Therefore the assembly of Greek/Spanish/‘Dutch Revolution’ Group of 01 June 11 decided to support the GVB workers. We will demonstrate our solidarity, and make the point that we all face the same crisis. We want as many people as possible to attend, and build for, the assembly! The GVB strike meeting is on Tuesday morning, 7 June 2011. We will meet 10am at entrance to Waterlooplein Metro Station (near the tram stop). We will then go the GVB strike meeting 10.30am. · Everyone should obviously bring his or her own messages too! There is a strong consensus that we need to build our group, to sustain momentum. We need to get our message out. We have discussed linking with other groups, including workers on strike. Therefore it was proposed to assembly of 01 June 11 that we collectively attend the GVB strike rally on Tuesday morning at 10am, Waterlooplein. 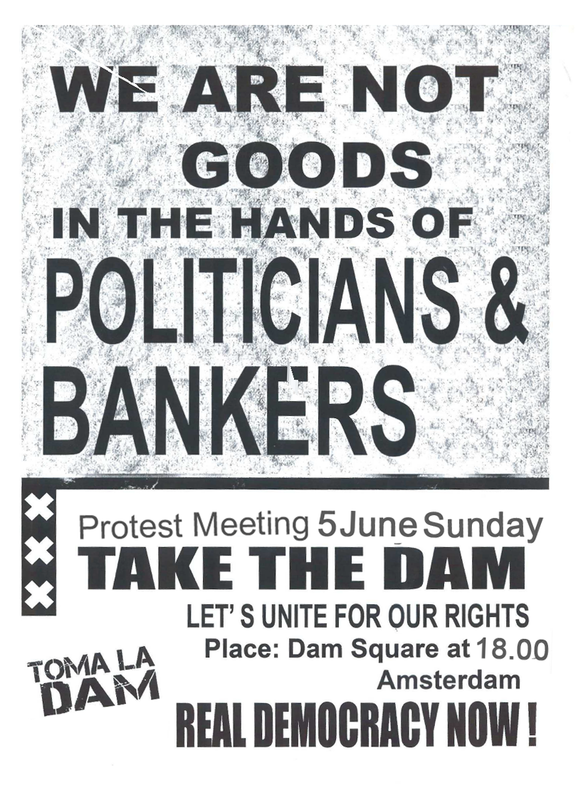 They are fighting against a 40% cut to services in Amsterdam (120 million euros). This is bad for everyone! A subgroup was arranged to handle organisational matters. So far we have organised a banner, to be painted today. Also we are making a small leaflet explaining that we are fighting the same crisis as the GVB workers. There are at least three facebook events, and lots of announcements. If you want to contribute organisationally, please see us (Wynand, Jelle, Vassilis, Perikles)! The connection between Spain, Greece and GVB: The world economic crisis of 2007–now, which led to bursting of the property bubble in Spain, and the debt crisis in Greece, affected every country. First it was in the US, then the crisis shifted to government budgets, especially in Europe, as states bailed out the big banks that caused the crisis through massive losses on speculation. Outrageously we – Spanish, Greek, Irish, EU, US, in short everyone – are being told “You have to pay.” But we (ordinary people) didn't create the debt! That was the banks, and the governments that backed them. In Spain they say "NO!" starting on May 15. Now in Greece, they say "NO!" And now here in Nederland the GVB workers also say "NO!" By being involved with the GVB protest, we will also break down barriers between Dutch workers and Spanish and Greek workers. It will reveal the false stories by the government and the media. It will make clear that their struggle is our struggle; that they come from the same source – governments slashing social services to pay for the failed speculation of big banks. To build our struggle, we must show all the connections between these seemingly separate struggles, and build up the links between them. Can you also go the (committee of the) cleaningworkers of the "Viva-zorggroep in Haarlem and Velsen?